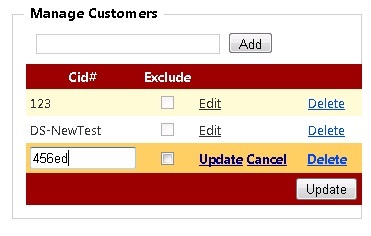 Here, what I am trying to do is that there will be a textbox in which the User will enter a unique CustomerId and then when he’ll click the Add button, the value should be displayed in a GridView (The GridView will be displaying the existing Customers for that User which, will be loaded from the database). 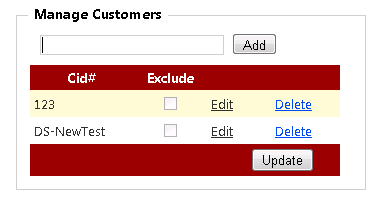 Similarly, if he wishes, he can add multiple Customers which will be displayed in the GridView. And, he can edit the existing Customer Details also. Finally, when he’ll click the update button the database query should be executed for only the Added, Modified, & Deleted rows. When the Page is loaded for the very first time I will get the Customers details for the current User in a DataSet (which will be the source of the GridView) which I have written the DataSet in the ViewState of that page. Similarly In the RowUpdating & RowDeleting event of the gridView, I am modyfying the DataSet value with the updated records & accordingly writing it into the ViewState. NOTE: To Delete a row from the DataSet I am using the DataRow.Delete() method & not DataRow.Remove() OR DataRow.RemoveAt() methods. Now finally, when the user clicks the Update Button, the application will fire the database query for only those rows of the DataSet which has been either added, modified, or deleted. Here, when the page is loaded for the very first time, I have loaded the information from the DataBase into a DataSet. This DataSet is then getting added in the ViewState of the page. Now whenever the User is doing some modifications, it will get updated in the ViewState of that Page only. Once the User clicks the Update button, I am checking, inside a seperate function(which is being called from the click event of the Update button), the RowState of each DataRow from the DataSet. More info regarding the enum DataRowState can be found here. 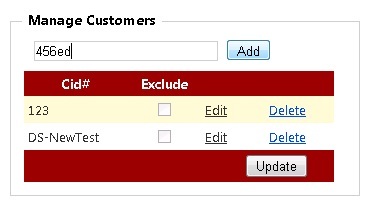 So for the modified rows only I am firing the database query. I have also kept the entire queries in the same transaction tran, so that I can Roll Back all the changes for any errors. 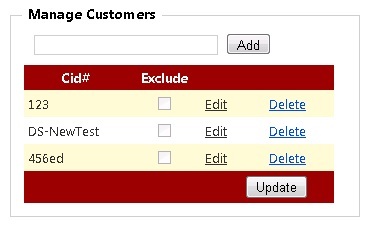 Finally in the click event of the Update Button, I am calling the DataBase.AcceptChanges() method to clear the RowState of all the rows of the DataBase before adding it again to the ViewState of the page. Previous Article Convert DateTime.MinValue of a asp.net GridView Column to a String Literal "Never"